Artful Affirmations: Next Happy June Giveaway and new Video! Tonight I am sharing two things with you....one, a new free video tutorial Tissue Paper Transfers and two, something I have made for my giveaway. If you haven't heard, I am having a month long Happy June Giveaway to thank all of you lovely readers! You can sign up to win this canvas as well as the other two items in my giveaway (that you can comment on HERE and HERE to enter). For Tea Time, just comment on this post. You only need be a follower to enter and win. I will be showing you two more giveaway items before the end of June, when I will draw the winners names. I wish I had a gift for each and everyone of you! I wish you all the best of luck! 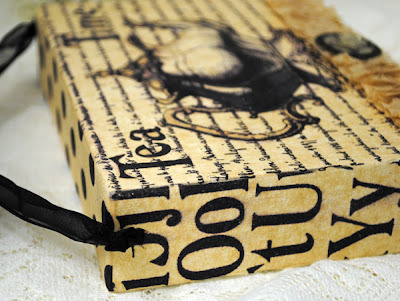 I created this Tea Time canvas by using the tissue paper technique in my new video. I applied the printed (and sealed) tissue paper with gel medium to canvas, being very careful to not let the colors run. Even though I sealed the tissue paper, the ink was still prone to running. I learned patience with this one! The tea pot is a fabulous image made available by Karen at the Graphics Fairy. ....as well, as some vintage trims, and rhinestone. 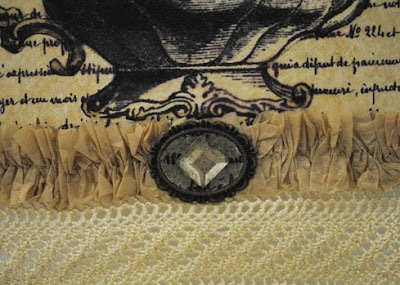 I love using black with this parchment colored tissue paper! I wanted to create something fun, and this is what I came up with. I am joining Karen for Brag Monday at the Graphics Fairy, I love seeing what everyone does with her images. then I could create a matching canvas! Thanks for the tut. Your canvas is beautiful. Terri, you make such beautiful things! I've seen you on various tea parties but had no idea you were such an artist! I love your tea time creation. I will be back to watch the tutorial when I have had some sleep and can absorb the information. It has been a busy busy week. 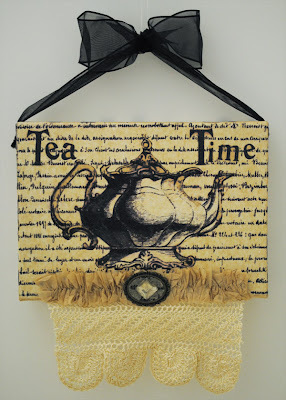 This tea time canvas is sooo sweet! I loooove all your creations! Gorgeous! I am amazed and can't wait to get home from work so I can check out the video! Thank you so much for popping up the video too - I'm going to check it out now! Oh I have wanted to know how to do this! Love that teapot style. Your canvas is lovely, and I appreciate your instructions! I am anxious to try your technique. Also wanted to say THANKS for your kind comment on my 'chocolate' coffee table! Wonderful video, Terri!! Thank you for sharing that with us. Tea Time give-away creation is terrific! Oh, you're so talented!! What fun you are, Terri! Thank you for showing us how to make tissue paper transfers. Your work of art with the teapot is beautiful. Wonderful always! oo wow this looks great!! thanks you for the titu! i have just discovered your site and am absolutely delighted! You're going on my blogroll! Another gorgeous piece, what a exquisite eye you have. Would you tell us which matte sealer you use on the tissue paper to prevent bleeding? Such a sophisticated colour combination, great looking canvas. Love the piece you created, please enter my name in for a chance to win your lovely art. Thanks for sharing your tallent with us! I love your canvas piece, so beautiful! And thank you so much for the wonderful tutorial! Gorgeous! I love your videos. You answer my "how do they do that?" question! Thank you Terri! Great tutorial -- thank you for sharing with us. Also, your tea time canvas is lovely! YOU are so amazing! I just love visiting your blog. You're so kind to add the turorials. Thanks! It's always fun visiting you, Terri! Your tea time canvas is beautiful! Thanks for your fabulous tutorial! Wow, thank you for sharing that tissue paper technique! I would have never thought of that. Do you have a link to show how you applied it to the canvas? The teatime picture is adorable! How easy you make the transfer look! Absolutely love your tea time canvas. Will def. give this a go...thanks so much Terri. Excellent designs, some very good photos with attractive frames. Oh, I do like your Tea Time canvas, Terri! Please enter my name. I am a follower. Your canvas is absolutely gorgeous and elegant Terri! And TFS your fabulous video, I can't wait to try this! That is so pretty! The lace makes it even more special. Ab Fab! Love your canvas Terri...one more item to add to my 'to do' list...lol. You make everything look so easy!!! Absolutely beautiful. This piece is how I stumbled upon your blog. I saw this featured on the graphics fairy blog. I started following you since. I would love this beautiful piece for my craftroom so I can be inspired by you even when I am away from my computer. I had to watch the new tutorial before signing up. Will give that a try. Your things are so amazing! Greetings!!! What a lovely tea time canvas. Perfect for this blog. Thanks so much for the Tut. If I don't win I will have to make myself one! Love the tea time canvas and thanks for the tissue paper tutorial! *skips and scampers around from one giveaway post to the next* Your page is a wealth of eye candy! 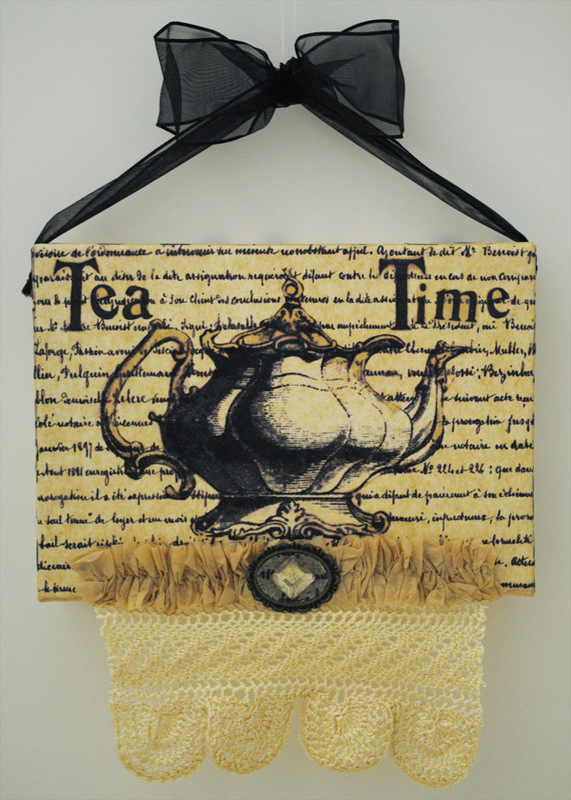 This tea time wall art canvas is soo sweet!